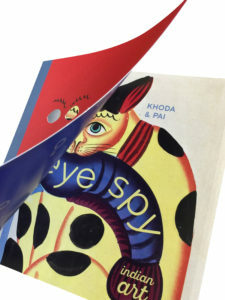 While researching for an article on Eye Spy Ritu Khoda and Vanita Pai shared a detailed note on the production process for the exquisitely produced book. Since it was too long to accommodate in the article I am reproducing it here with their permission. It is worth reading to understand how a book can be made. Children enjoy tactile activity. So we build in a great number of flaps, foldouts, stickers and die cuts, besides drawing and painting exercises. Usually, the artwork determines the production treatment and we work really hard over this. We never choose effect over relevance, and we are pleased that many readers have noticed the thought behind every page. 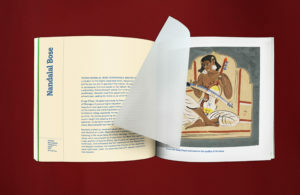 We chose Manipal Technologies to produce the book. Their technical expertise and availability of skilled manual workforce made it our only choice for the level of complication involved. Extensive manual tipping meant that the forms had to be perfectly organised for binding in the correct order. • All eight perforated, foldout section separators had to be tipped manually. Vanita has designed and printed corporate calendars with MTL with a greater complexity level. These were relatively simpler operations. The complication arises while planning when they are trying to organize forms since there are different sheets and papers involved, and during prepress because it requires detailed DTP work such as precise keylines, diecuts, etc. Moreover, it was the first time that MTL packaged as many and diverse special operations in one product. This was appreciated by PrintWeek India Awards 2016 jury who gave the book Special Mention in the “Innovative Print Product” category. We never force a treatment. It must add to the idea. For instance, a transparency sheet revealing the various arms of Durga in Manjit Bawa’s artwork on page 112 would not make sense because there we are talking colours. But Nandalal Bose’s mastery of lines and strokes lends itself to the transparency solution. So that children can see the emotion strokes can add to a painting. Likewise, the die cuts on Sultan Ali’s work on page 93 -95. We want children to notice the expression on the creatures, and the idea is in sync with “Eye” spying game.